This episode was based on the short story 'The Adventure of the Christmas Pudding', first published in 1923 but later expanded into a longer version. It was adapted for television by Anthony Horowitz, with Clive Exton as a script consultant, and directed by Andrew Grieve. Again, the adaptors were faced with the challenge of adapting one of Christie's longer short stories for the 50 minute format. And yet again, Horowitz (with Exton) does an excellent job. This adaptation really is impressively faithful to its source material. There are, however, several minor changes, and I will try to outline them all. First, there's a nice little scene with Poirot at a chololatier, preparing for a quiet and warm Christmas on his own (Hastings is in Scotland, Miss Lemon at an aunt's in Torquay - notice the little Christie reference there). Second, Poirot is understandably much more upset and annoyed by the prince (who here becomes the historical character of Prince Farouk of Egypt) throughout the episode. In fact, the prince actually stays at a local pub near the Lacey's to keep an eye on the proceedings, much to Poirot's despair. Third, Colonel Lacey has become an Egyptologist and a friend of the prince's father in this one - and, in fact, one of the few people who knew about the ruby. Moreover, David Welvyn, the family friend, also becomes an antique dealer (or something of the sort), who is asked by Lacey to pick out an object from his collection for sale (Lacey having lost a lot of money on stock speculation). These changes make a lot of sense. In fact, they iron out one of the peculiarities of the story; why Kings Lacey would be the key to the story in the first place. 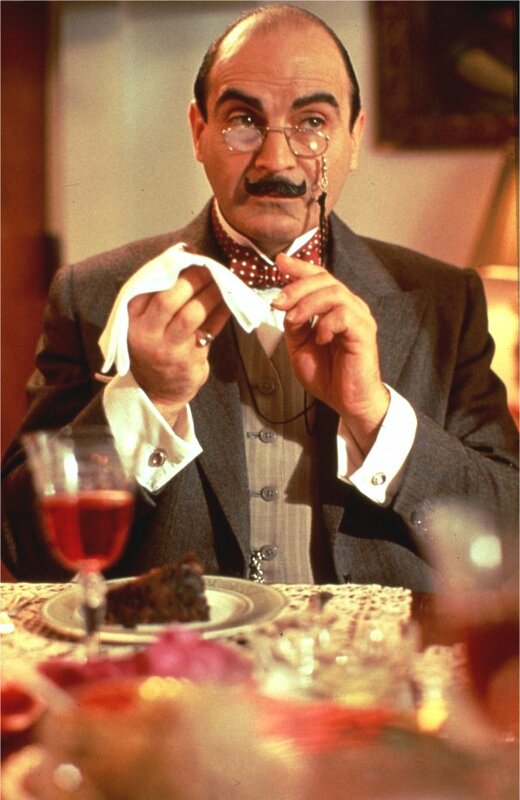 Fourth, there's a small scene added in which Poirot shows the other guests how to cut a mango (an addition, according to Peter Haining's book on the series (p. 72), that came from a dinner David Suchet attended as a guest of the Queen and Prince Philip. The Duke taught him the trick, and Suchet asked the scriptwriters to include it!). Finally, there are some minor changes, including changing Edwina Morecombe into Edwina Jesmond, the wife of Mr. Jesmond; the maid Annie overhearing the conversation in the church rather than in the room; Poirot overhearing the 'murder plot' from his bedroom window instead of from the library; Desmond Lee-Worthley's sister not being hospitalised (and, in fact, Desmond being an altogether different character), Poirot seeing Desmond drugging the coffee, and of course the ever-present chase scene (this time to Elstree aerodrome). In sum, the episode works very well with only minor changes and additions. Grieve's directing is competent and works well for the episode. The production design is nice, as always. Locations include 'Joldwynds' in Surrey (Kings Lacey, also used as Davenheim's house in The Disappearance of Mr. Davenheim), Ye Olde Bell, Hurley, Berkshire (the guesthouse), the Royal Arcade (28 Old Bond St., London), The Adelphi building, the Strand (used as the Adelphi hotel), the Foreign Office and Whitehall. See here and here for location photos.The soundtrack works well. Notice that the theme from 'The Kidnapped Prime Minister' is used again here - I sense a government theme). Of the guest actors, standouts include Stephanie Cole and Frederick Treves (the Laceys). It was a pleasure to watch Stephanie Cole as Mrs. Lacey. She is one of these few actors who give a completely natural impression. I always felt the impression that Stephanie Cole was a better actress to star as Ariadne Oliver rather than Zoe Wanamaker. I know Cole played Mrs. Oliver in a BBC radio production of Halloween Party and some other title that escapes my mind at the moment. Zoe Wanamaker just didn't fit the physical description that Christie describes in the stories. The difficulty of covering the entire countryside for the chase scene seems to have deprived the episode of snow, which is such an important element of the original story. That is very true. I re-read the short story just the other day and realised that both elements were missing from the adaptation. I don't understand why they would exclude the tourniquet reference. They could easily have cut parts of the car chase (which, in any case, is completely unnecessary). I thought Desmond didn't even really try to feel her pulse. He lifts her arm and reveals the ruby, which he "surreptitiously" takes. He pretended that he checked her pulse while actually stealing the ruby (again), and to cover his theft and give time to escape, says he felt nothing and volunteers to get the police. The lack of snow for a Christmas based episode was very disappointing. The house felt sterile. The lack of snow bugs me too, as does the presence of mangoes during Christmas. Being an Indian I can assure that mango is a fruit that grows only in the height of summer.